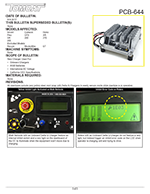 Product change bulletin's provide you with what has been changed on a machine. These changes are for the better, whether it be design improvment, stronger materials, or aestetic change. Only the most recent and relevant PCB are listed here. Please look around and check back from time to time, these are full of usefull information and spell everthing out for you that is needed. New Stainless Steel Environmental Package is available. Standard Squeegee Drag Link Assemblies are now powder-coated, rather than plated. New Spring underneath Shroud Adjustment Knob. New Rubber Washer ontop of Shroud Adjustment Knob. New Charger used for: Onboard Charging, AGM Batteries, International AC Voltage, and California CEC Specifications. Cylindrical hoppers removable from either side (left or right). Cylindrical models now have a crows foot tool standard for easy access and repairs to motors. 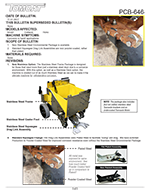 All scrubbers are switching over to a Corrosion Resistant Yellow Poly Drain Saver. New ZerO3 and Suds combination options available on machines. 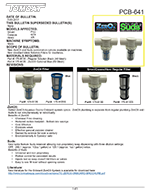 New standard Inline Solution Filters for machines. 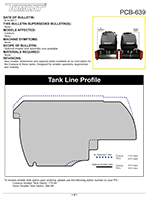 New smaller dimensions and capacity tanks available as no cost option for the Carbon & Hero tanks. Designed for smaller operators, ergonomics and visibility. New Stainless Steel Baffle standard. New drop-in Float-ball screen and enlarged Float-ball. New white Vacuum Filter. 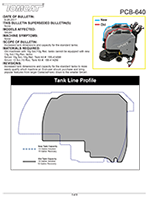 Retractable front fill-hose. New standard grip face for premium adhesion. New Aluminum Driver Plate prevents liquid contaminants from accessing the Eccentric Bearing. 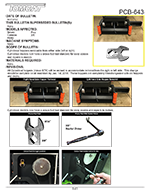 We now offer a new optional 5:1 expandable, drain hose extension as well as we have revised our Jaw design to allow for better clearance as well as adjust-ability. With the production of our new style squeegees, we now introduce 2 new sizes: the 33" and the 39". The purpose of this Product Change Bulletin is to inform about new programming parameters required on our new walk behind scrubbers as well as a new Inline Solution Filter mesh. Standard Water Proof Switches and Serial Specific Key Chains with QR Codes. To inform about the new models of Floor Sweepers as well as the new standard tires and new standard Control sticker for Walk Behind Sweeper Machines that begin on February 1st, 2014. To inform about the causes and consequences of a unleveled deck, how to level a deck, as well as mention all Machine Models where Deck Levels are now standard. 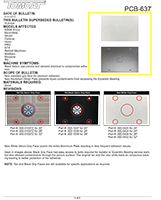 This bulletin goes through all of the recent EDGE updates that we have incorporated into our designs to better handle our Polishing and Grinding work with Marble, Terrazzo, and Concrete. 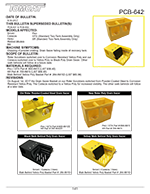 This bulletin details the different kits for servicing the isolators and eccentrics on EDGE machines. XR machines are now shiping with a newly designed vac filter & tank. Brush deck actuator is now standard on Micro machines. 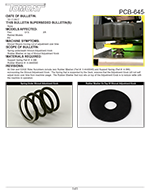 A retro fit kit is available for machines built with foot pedal. We have upgraded our website in many ways over the last couple years. 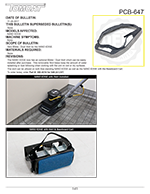 This bulletin will help show what�s new and what�s changed. Change of tread pattern on solid tires to improve gripping even on wet floors. New red paint is smoother and easier to clean. It has 15% gloss, which is the minimum we can get with the crinkle look, so its more susceptible to surface scratches, and care should be taken. We changed the cylindrical pulleys from black oxidized to plated to prevent corrosion of metal. This keeps the sprockets from getting rusted in turn causing the belt to get worn faster. We added grommets to the bolts holding the tower roller bracket onto the cylindrical deck to act as a shock absorber to negate some damage from running the machine into a solid object. The design of the Broom Driver and the Broom Lateral Arm have been revised. Resulting in fewer problems with the main broom slippage on our sweepers. 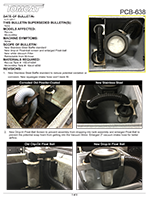 We have added a part to control and eliminate the splashing caused by the recovery water being discharged into a full debris laden drain saver.